Foreign supermarkets are struggling to compete in China's big cities where consumers are increasingly going to online shops and local, community-centered shops, experts said on Thursday. Earlier this week, Japanese supermarket chain Ito-Yokado shut down another of its stores in Beijing after 13 years of operation, according to a statement posted on the website of the company's China unit. This marked Ito-Yokado's seventh closure in the capital in recent years. There is now only one Ito-Yokado outlet remaining in Beijing. Senior executives at the firm promised in an interview with Beijing Business Today in late April that the last store in Beijing will not be shut down. 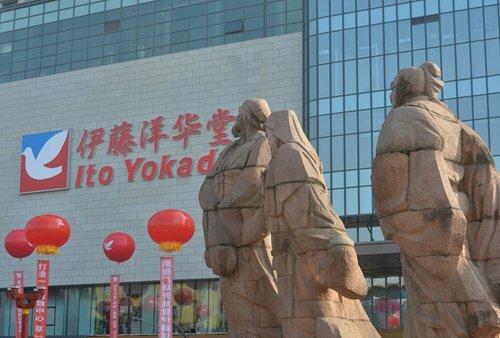 China is Ito-Yokado's only overseas market so far, and in the future they plan to focus on the Chengdu market rather than first-tier cities like Beijing, according to the report. The company's Beijing branch could not be reached for further comment by press time. French hypermarket chain operator Groupe Auchan has slowed down its expansion in China since 2014, according to annual reports filed with the Hong Kong Stock Exchange by the French company's joint venture, Sun Art Retail Group. There were 78 Auchan stores in the Chinese mainland by the end of 2016, in comparison with 74 stores by 2015 and 68 by 2014. On Tuesday, Shen Hui, general manager of Auchan's China unit, announced that he would resign, domestic retail information provider linkshop.com reported. "Supermarkets and megastores can no longer meet the new consumer trend in China, in first- and second-tier cities in particular," Chen Yuefeng, editor-in-chief of China Chain Store magazine, told the Global Times Thursday. Besides online shopping, Chinese consumers in big cities are now more eager to shop in smaller stores dotted among office buildings and communities, which are more convenient, rather than driving a longer way to big supermarkets, Chen said. The new trend was also reflected in a survey report issued by China Chain-Store & Franchise Association on Tuesday. Sales in China's convenience stores last year rose 16.7 percent year-on-year, according to the report, while sales growth for supermarkets was 1.5 percent and department stores saw a 2.5 percent drop in sales. Major retail companies have already made some adjustments, opening nearly 6,400 new stores, the majority of which are convenience stores and specialty outlets, the report said. US retail powerhouse Wal-Mart Stores Inc has been shifting its focus from hypermarkets toward other business models, such as high-end shop chains, online marketplaces and the membership-based Sam's Club. Having opened three Sam's Club shops last year, Wal-Mart said in a press release sent to the Global Times in February that they would open another three to five this year. In addition, Wal-Mart said they would be cooperating further with JD.com Inc, China's No.2 e-commerce site, in which the US retailer nearly doubled its stake last year. Amid its business model diversification, Wal-Mart's overall sales in China during the quarter that ended January 31, 2017 rose 5.4 percent year-on-year. Customized, community-centered shops and online shopping channels will see more popularity, and they have the advantage of being more cost-efficient amid the economic slowdown, Wang Danqing, a partner with Beijing-based ACME consultancy, told the Global Times Thursday. "It is a wise move for foreign firms to scale back their presence in the supermarket segment where the competition has become fiercer, as domestic shopping malls and department stores would usually be equipped with supermarkets," said Wang.